The kitchen islands have been a resource of increasing use in the interior design projects of the last decade. Surely, the reasons are several but we want to highlight one that breaks with the main premise that our clients assumed as inescapable: space. “I would like to have a kitchen island, but it requires a lot of space.” This statement makes sense if we consider the kitchen as a closed room and isolated from the whole of the house, where the island is inserted in the center of the rectangle that contains the kitchen. 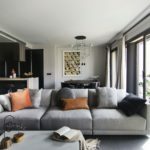 If, on the contrary, we choose to open the kitchen to the rest of the spaces, the island becomes an unbeatable ally to distribute and link the different zones. The kitchen islands enable open steps that allow us to do without walls and corridors, gaining breadth and work surface not only for the kitchen, but as a polyvalent surface where you can sit and check information, have a snack or chat. Apart from its distributive potential, kitchen islands offer the possibility of incorporating multiple functions. From extendable tables or extra storage to enable work points or spaces interpenetrated with the living room by incorporating the dining area. 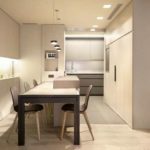 In this way, today in the face of the renovation of a home, the kitchen island corresponds more with a solution than with a luxury conditioned by space. 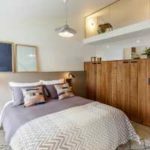 In fact, following the current layout of kitchen islands in interior design, the increase in available space becomes a potential consequence rather than an intrinsic restriction. It will depend on the talent of the team of architects and interior designers in charge of the project. Kitchen island arranged transversally with the linear of the rest of the kitchen and in communication with the rest of the living room. 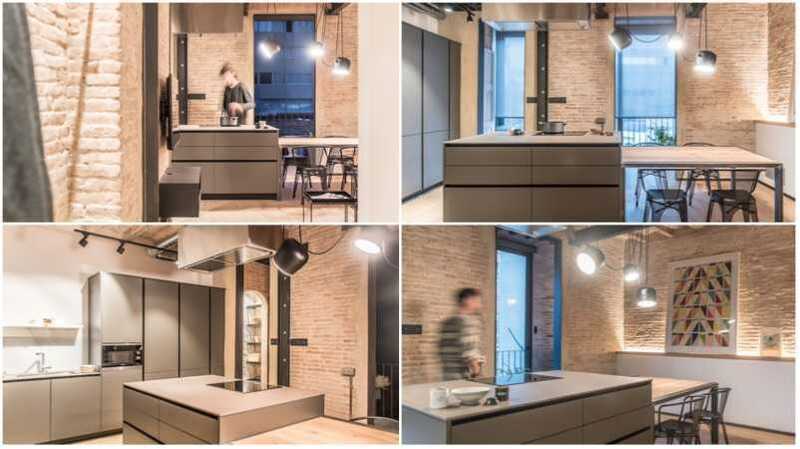 The kitchen island is composed of two pieces: a work area with ample storage, induction plate and hanging filter group; followed by a dining table illuminated by a set of hanging spotlights, for this apartment industrial and modern in the Gracia neighborhood of Barcelona. 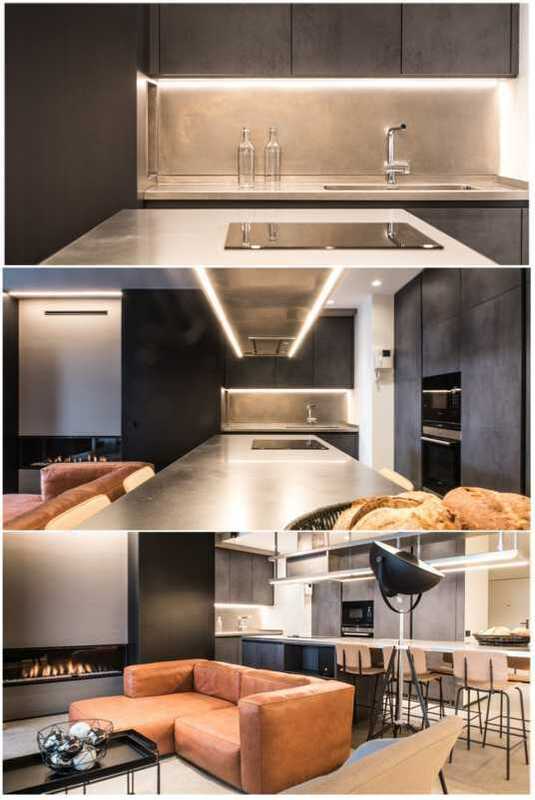 In this interior design project of a duplex in l’Eixample of Barcelona, ​​we can see the kitchen island made of black iron sheet and stainless steel envelope covered by a hanging structure that accommodates the filter group, in addition to providing extra space for eventual storage. In this case we find inserted at the same height the cooking plate and the dining area incorporating stools, in addition to an L arrangement of the other kitchen components such as the oven and refrigerator on one side and the dishwasher area on the other. In this case, the kitchen island is located in a large kitchen space connected to the living room by means of a transparent glass sliding door. 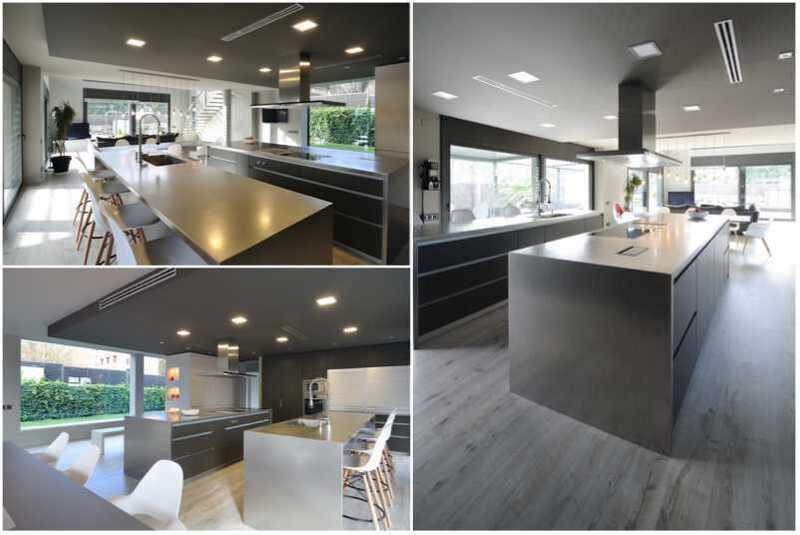 In this triplex located near Barcelona , highlights the filtering group installed in the false ceiling giving a clear and clean image of the whole, as well as the huge storage space where different appliances are integrated. In the design of the kitchen island of this detached house behind the mountains of Vallvidrera , the space was not a problem either and given the passion for the kitchen of our customers, we chose to have two large parallel kitchen islands hosting on one side the water and dining area, while the another cooking equipment and large drawers for storage and the inclusion of the dishwasher. In the other we find the water area, this time flanked by a set of stools that enable this second edge as a bar to sit down to eat or perform any other activity. 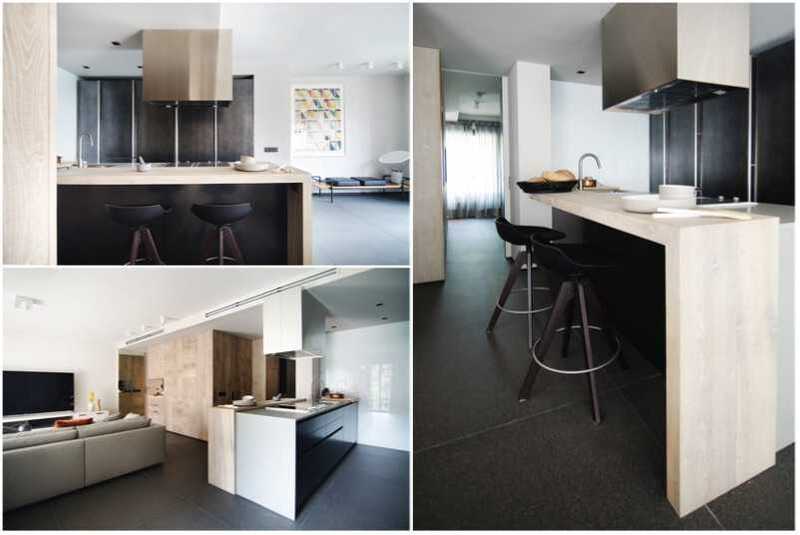 In the already famous apartment that we designed in Andorra , we arranged a long kitchen island in stainless steel for the cooking and working area and natural pine wood for the dining table, in coherence with the whole of the house. The arrangement of this kitchen island enables a passage from the entrance and in turn is after a module that accommodates the large electordomésticos of the kitchen as the refrigerator or oven. In the Sarrià’s apartment , which we completely transformed, the Kitchen island was erected where before a wall that formed a room was raised. In this way, we open the kitchen to the whole by its arrangement. The encabalcamiento of two envelopes gives a differential aspect of the volume so much by the side bar-dining room as by the zone of work. In this case, the envelopes determine a surface that integrates perfectly to the set using the black color to be confused with the chosen pavement increasing a certain sensation of lightness to the set. In the single-family house in l’Eixample in Barcelona , the cooking island runs longitudinally along the entire line of the stairwell serving as a separation and arranging the set of elements such as the sink, cooking and dishwasher integrated in one piece, which also incorporates a dining space next to the window from the end. Along the entire surface of the kitchen island there is a hanging structure that accommodates the filter group, storage, as well as lighting and electrical connections for easy access and working conditions for cooking. Additionally we present a kitchen island of a floor in l’Eixample de Barcelona that works as storage and extra work area as well as hosting an extendable dining table made of black iron sheet and an envelope of the same material as that used in the envelope of the kitchen island and the hanging lamp both of own design of Coblonal Interior Design. 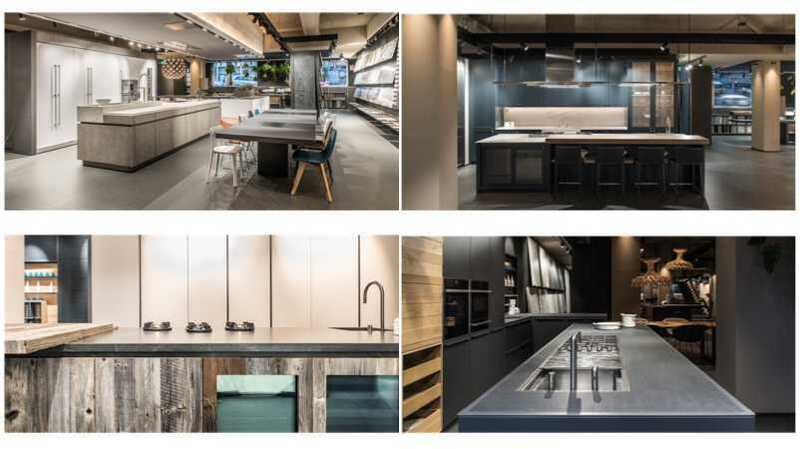 Finally, we can not fail to mention the new Kitchen Showroom that we have designed and built for Azul Acocsa where we can find different cooking islands with the most avant-garde aesthetic technology and proposals.